To say that we are extremely excited to have opened and begun operating our Sichuan program routes, is an understatement. So what exactly is it that makes us so thrilled about Chengdu and the spicy lands that lay beyond? Let us give you some highlights from recent scouting trips and programs this spring. 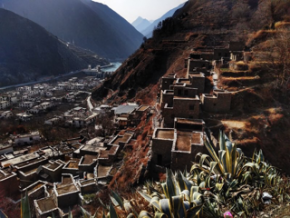 The past season saw our trailblazing program development team scout out and open routes to three different Qiang Minority villages in Western Sichuan’s Wenchuan County. Think stone fortresses set in the sharp rocky mountain valleys of Wenchuan, surrounded by fruit orchards, and big blue skies. These different villages are at all different levels of tourism development and each have something special to offer to those willing to make the track out west from Chengdu. Qiang Minority food out here is a particular highlight, getting to feast on hand smoked meats, ferns and wild vegetables. Though many people’s only association with Wenchuan is the 2008 earthquake and the devastation it caused, what is truly amazing is the level of investment in infrastructure and tourism development in the region by the PRC. Wenchuan town itself is home to a fascinating local street market as well as some fantastic riverside dining and a celebrated “plaza dance” party. It just doesn’t make sense to take a trip to Sichuan without visiting the Giant Pandas, and we have seen quite a few Panda bases! 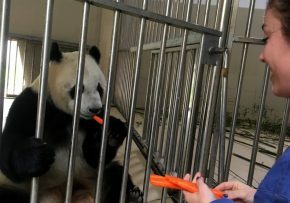 A recent connection with a local partner brought us out west to a Giant Panda Breeding base, and it turned out to be the most personal and exciting panda experience we have been on yet. It is far enough out of Chengdu that you are way up in the beautiful, vast mountains of western Sichuan, yet it is far lusher than nearby Wenchuan. This green, mountainous climate is where the pandas live in out in the wild. Visiting the base is a great opportunity to get close to the pandas in a natural setting. 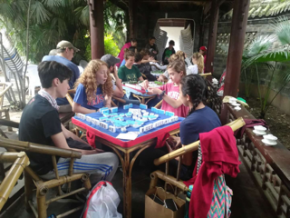 We recently brought a group of university students from Texas and were particularly impressed with the immersive full day panda volunteering experience. Being face to face with the pandas and feeding them by hand is something truly special. Also thanks to our local partners’ expertise, the local homestays and guesthouses, this base area has quickly become a favourite location. Of further interest, the land surrounding and connected to the Panda base is being developed into a massive national park to protect the Pandas and the other species that co-habit in the area. Some of the pandas we had the privilege of observing and interacting with on the base will ultimately be fully introduced into the wild. Famous the world around, Sichuan’s fiery food is a main attraction in its own right. Group hot pot welcome dinners always go off with a bang and our pool of awesome Sichuanese digs is constantly expanding thanks to our hardworking team of foodies on the ground. 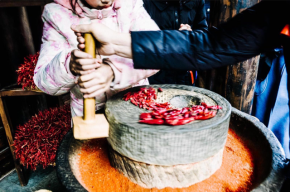 We are proud to collaborate with Chengdu City’s very own Chengdu Food tours to offer some immersive street tours and market visits to famous local restaurants that you could never find without the street-savvy of a local partner. Joining these tours has also been a way for our crew to try foods they never even knew existed! Have you ever wanted to eat a rabbit head or “pig brain mapo-tofu” but just couldn’t muster up the courage yourself? Let us hold your hand and show you the way…. 耍(pronounced shuà)！ Few things can so simply and beautifully sum up the overall feeling and culture of famously laid back Chengdu as this single character. Many visitors can feel it in the air the moment they arrive, a palpable feeling of ease and relaxation that is rarely found in cities of such size. 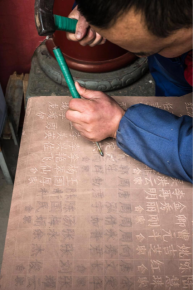 While walking the streets of any of China’s great cities on the east coast financial belt, conversations of money, business and trade are daily occurrences. But in Chengdu, locals are comfortable just talking about eating spicy food, sipping tea, and playing mahjong. Chengdu residents claim to be the first practitioners of “Nong Jia Le” (农家乐)， or “farmers happiness” tourism in China. Nong Jia Le has blown up in popularity all over the country in the last decade, and Chengdu is definitely one of the best places to do it. The setup is simple; farmers open up their homes into guest houses and restaurants providing home-style accommodation and local homemade food. One of our favorite things about Nong Jia Le spots is the general shuà耍 attitude of the owners and their flexibility to provide all sorts of delicious dishes and unforgettable experiences. Want to learn how to make tofu? No problem! Fishing? Can do! You want to hang out in the kitchen and talk to the chef while he cooks for you and your friends? Come on in! So you want to plant some potatoes? Be our guest! Can you recommend a hiking spot? Follow me! It is true that some of our best ever China memories have come from Nong Jia Le experiences and we feel that no China trip in general is complete without at least a visit and a night stay at one of these guesthouses. The widespread love of fresh food, and having fun as a lifestyle all over Sichuan makes Chengdu a perfect place to get your “farmers happiness” on.